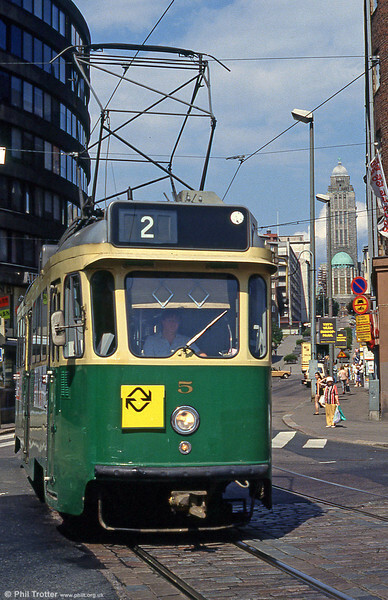 Helsinki is the only city in Finland to still have a tram network. HKL Tram Transport runs the trams on behalf of HSL Helsinki Region Transport and is also responsible for maintaining and replacing rolling stock.Trams in service are mainly Finnish articulated trams manufactured by Valmet and Strömberg (NRV I and MLNRV II). There are a total of 82 of these. Car 5 at Siltasaari on 1st August 1991.